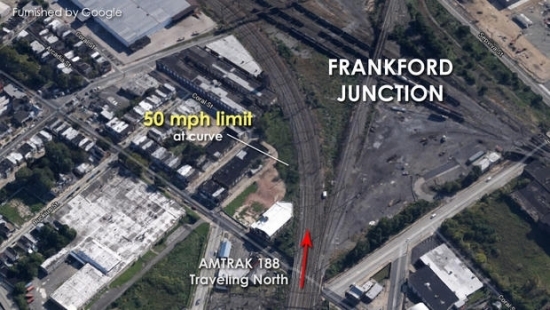 Emergency crews are on the scene after a passenger train derailed Tuesday evening in the Philadelphia's Port Richmond section. It happened around 9:30 p.m. on the 2000 block of Wheatsheaf Lane near Frankford Ave. The Amtrak Northeast Regional train #188 was making its way from Washington, DC, to New York City. Over 140 people have been injured in the accident, 6 critically, and there have been at least 5 deaths. The wounded are being taken to a variety of area hospitals including Temple University Hospital, Hahnemann University Hospital, Jefferson University Hospital, Aria Torresdale Hospital, and Einstein Medical Center. The injured are being transported in ambulances as well as SEPTA buses. Buses are also helping transport the walking wounded and other passengers. The cause of the accident is not yet known. 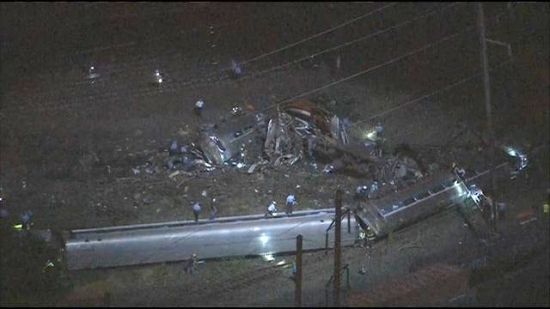 The NTSB has a "go-team" on its way to Philadelphia to gather information about the crash. Seven cars including the engine derailed. There were approximately 238 passengers and 5 crew members on board at the time of the crash. The accident triggered a 4-alarm response from the fire department with 33 apparatus and 122 firefighters/emergency personnel on scene. It is a level 3 mass casualty incident. Over 200 police officers responded to the scene. Philadelphia Police, Firefighters, and EMS along with Department of Homeland, Amtrak, and State Police were all on hand. Governor Tom Wolf came to the scene of the accident around 1 a.m. and met with Mayor Michael Nutter and briefly addressed the media offering any help from the state level. Amtrak has canceled Northeast regional rail service for the rest of the evening. SEPTA has suspended the Trenton and Chestnut Hill West Lines for at least Wednesday and probably for the rest of the week. Friends and family of those on board the train can call 800-523-9101 with questions and for information. Webster Elementary School at 3400 Frankford Ave is being opened by the Red Cross as a shelter for passengers. Authorities do not yet know if everyone on the train is accounted for yet, they haven't been able to check the manifest yet. 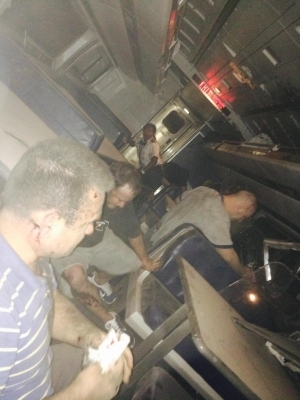 Former Congressman Patrick Murphy was on the train and tweeted photos. Please keep the passengers and all emergency personnel in your thoughts as we continue to respond to the train derailment.